A strand of Freshwater Pearls with a Silver French Souvenir Lourdes Cross with a Sacred Heart Center. 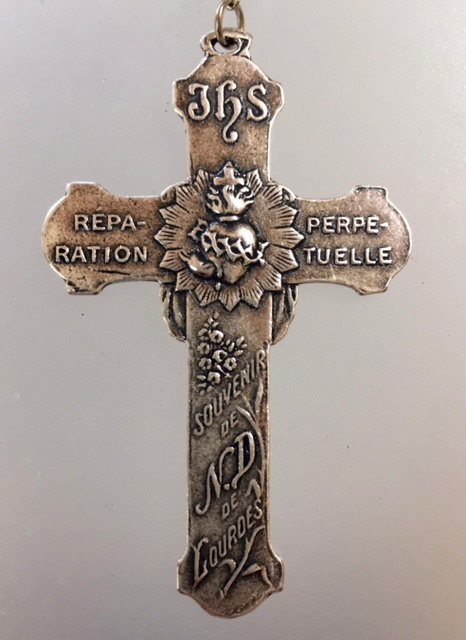 This is cast from a Very Rare antique religious cross from the 19th century with the radiant Sacred Heart of Jesus and the inscriptions in French for Perpetual repairing and Souvenir of Lourdes. The reverse has the Holy Face on the Veil , the tools of Christ, the Crown of Thorns and Agnus Dei, the lamb of God. The Cross is suspended from an embellished pearl on a strand of genuine freshwater Pearls!! The Cross is cast from the original Art Nouveau French pieces over a century old, this lovely reproduction is hand crafted. Pearls are 28" Long, Cross is 2 5/8" tall.